Nestled somewhere in between The Hunger Games and Divergent series is The Maze Runner. Like those two, it’s centered around young adults and set in a futuristic society. But this movie is entirely it’s own. It’s suspenseful and thrilling all while maintaining a sense of intimacy sorely lacking in other YA franchises. 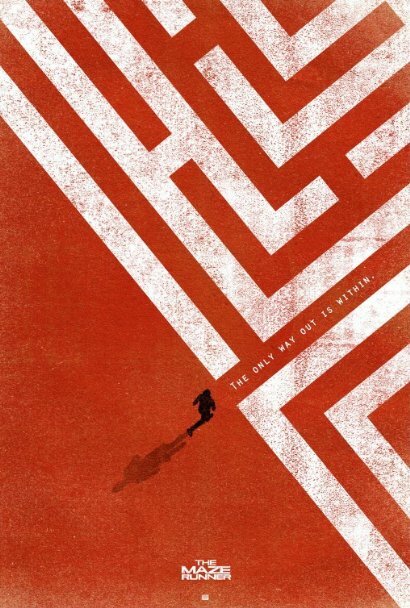 Story flaws and a dreadful ending don’t stop The Maze Runner from ultimately triumphing as it proves to be a successful opening chapter in the series. An elevator shoots up toward ground level at lightning speed. Inside is Thomas (Dylan O’Brien) and a month’s worth of supplies. He vomits, has no idea what is going on, and is obviously in a state of shock. That’s when it comes to a screeching halt. Doors swing open and hovering above him is a group of boys. Thomas is this month’s new crop and just like the boys before him he can’t immediately remember his name. Who sent them and why is the common variable amongst this cast of ragtag characters. Except for Thomas. He’s not like the others. He’s curious. The opening is so well done as it slowly introduces us to the young men and their surroundings. Alby (Aml Ameen) is the leader because, “somebody had to be the first one. 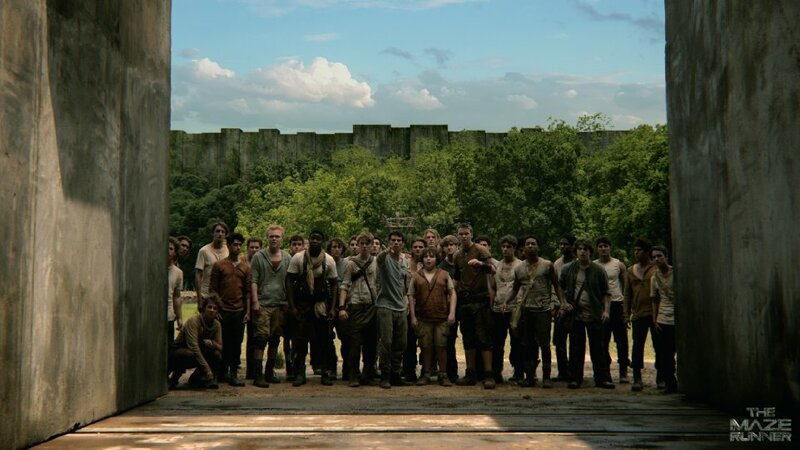 Alone for a month.” He takes Thomas, and us, around what is called The Glade. It’s a fully functioning society with living quarters and farming space. Alby tells him, “We only have three rules. First, do your part. Second, never harm another Glader. Most importantly, never go beyond those walls.” Everyone has a job to ensure order because as we’re told, it hasn’t always been so peaceful…there were bad days. All is well until Teresa (Kaya Scodelario) arrives. She’s the first girl ever, and a note in her hand promises she is the last person, and round of supplies, that will be sent. Chaos ensues. Big ensemble pictures rely on strong acting and unique writing to really differentiate between all of the characters. 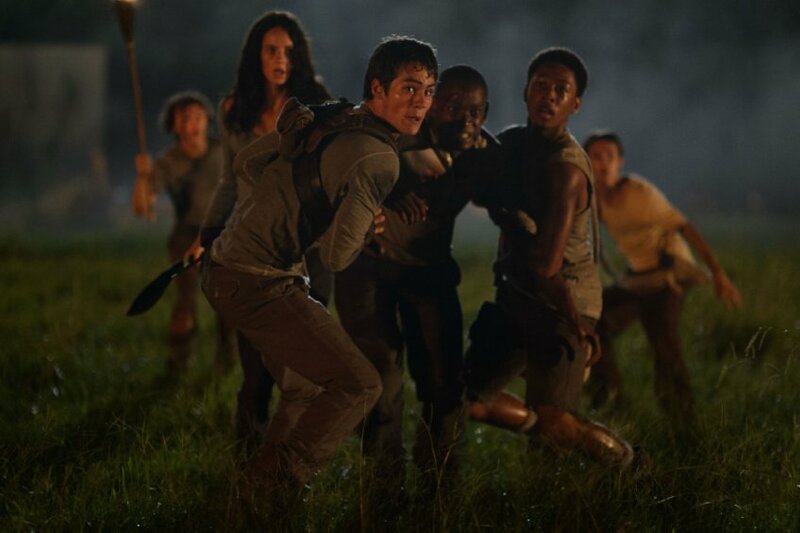 In that regard, The Maze Runner comes close to perfection. Second in command is Newt (Thomas Brodie-Sangster), the most welcoming to Thomas. Gally (Will Poulter) is a Builder and blames Thomas for changing everything. Minho (Ki Hong Lee) is keeper of the Runners. They’re the ones who map out the maze in search of an exit. As you can tell, everything revolves around Thomas. While O’Brien is a likable guy (check out The First Time. It’s a great guilty pleasure movie), Thomas is stuck asking questions the entire movie. His character is poorly written and O’Brien never gets the chance to stand out from the excellent supporting performances throughout. I normally don’t compare movies to the books that they’re based on. It’s such a different artistic medium that I think you’re forced to accept each on its own terms. However, I was surprised how much was omitted, and how the movie still achieved everything it sought out to accomplish. The imagery and set design is impeccable. The script, while uneven, has pitch perfect timing and doesn’t settle for cheap thrills or suspense. Nearly every moment counts. Chances are you’ve seen glimpses of director Wes Ball‘s eight minute short Ruin without even realizing it. That’s an excellent preview to the kind of work he does on his big screen debut. 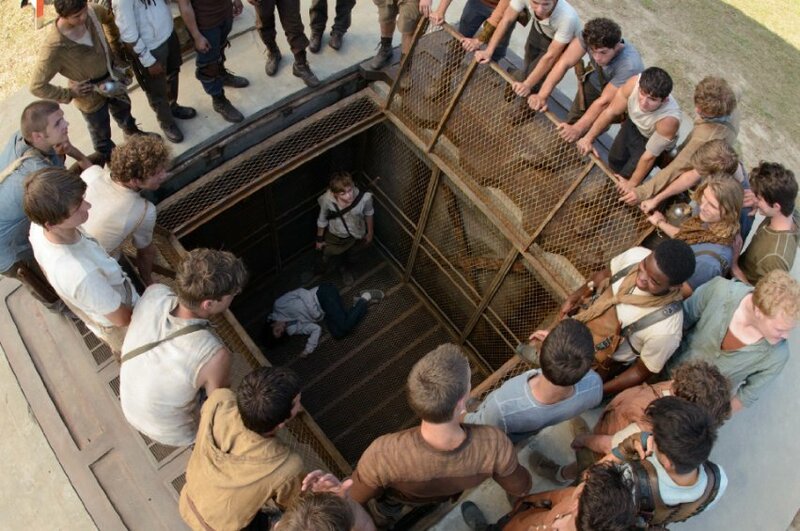 While the characters are in the maze and out in the Glade, Ball is able to achieve all of the suspense that he wants. Don’t be mistaken; this is a thrilling mystery that keeps you guessing until the very end (unless you’ve read the book). That’s where the problems start to pile up. The story is so dead set on delivering a sequel, in the book and the movie, that it never really feels complete. While we’re robbed of an ending, The Maze Runner is still better than most movies of its kind.